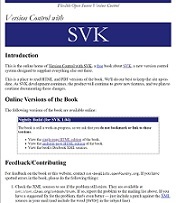 SVK is a free/open-source version control system. That is, SVK manages files and directories over time. A tree of files is placed into a depot on the user's machine. The depot remembers every change ever made to your files and directories, and also to other files and directories that you mirror from other places. This allows you to recover older versions of your data, or examine the history of how your data changed. In this regard, many people think of a version control system as a sort of "time machine".